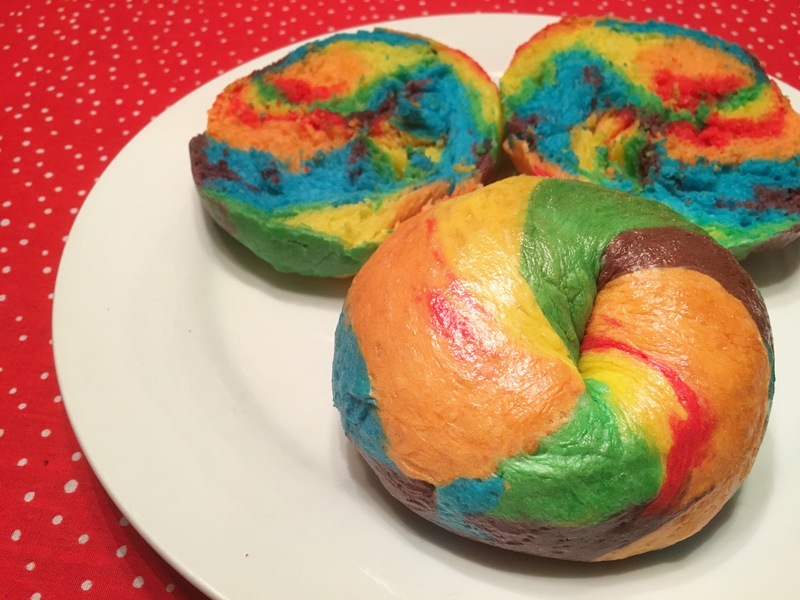 I’m sure everyone in North America who’s on social media has seen the recent video of the Rainbow Bagels from The Bagel Store from New York. 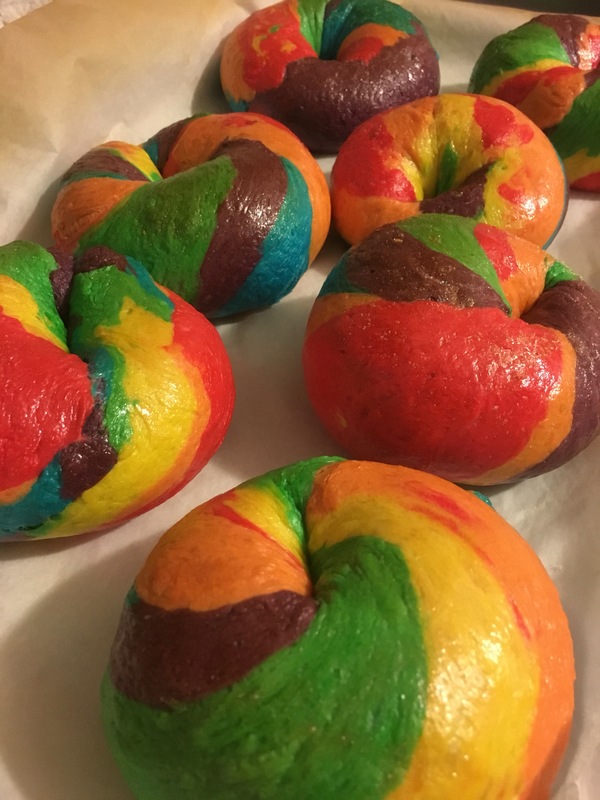 While I don’t think they’re the “world’s most beautiful bagel”, I really did want to stuff my face with some of these rainbow baked goods. And then I also learned that bagels were boiled. So since I don’t live anywhere close to New York, I decided I had to make my own. I couldn’t quite find a recipe, but I figured it can’t be too different from regular bagel recipes. 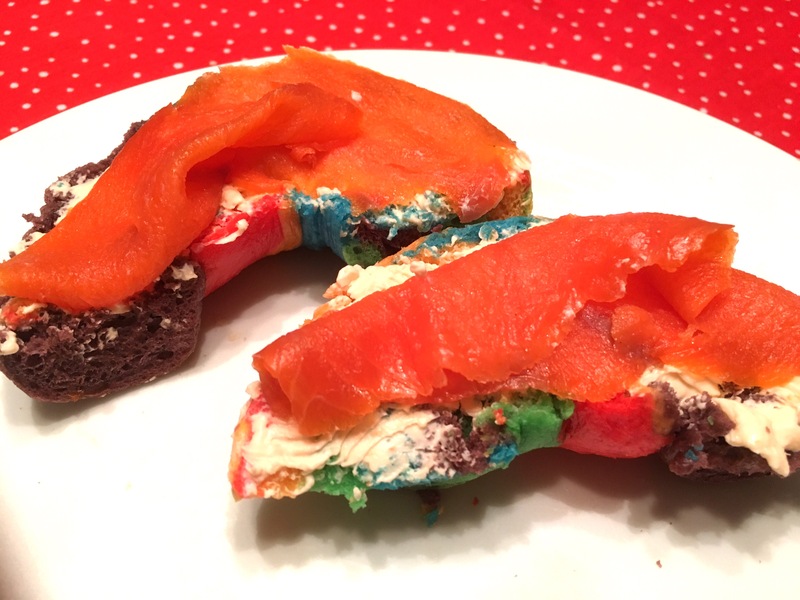 So here’s the recipe and instructions from a total bagel noob. They came out delicious. Or well, they basically taste like regular bagels, but fresh from the oven and super pretty. 1. Mix the yeast and 1/4 cup of warm water into a bowl. Let it sit for 30 minutes until it bubbles and doubles in size. 2. Mix flour and salt in a large bowl and set aside. 3. Get another large bowl and mix in oil, 3 cups of water and your bubbled yeast mixture. This is now your bowl full of liquids. 4. Add flour into the wet mixture a little at a time. If you require a bit more water, add a teensy bit. We kneaded the dough as we went, folding the flour and liquid together. We kind of eyeballed this part until we formed a dough that was not too dry nor too wet and everything was well stuck together. 5. Put the dough in a large greased bowl and cover the top with saran wrap and a warm towel and put somewhere room temperature/warm to let it double in size. This will take about 1 hour. 6. Don’t throw away your saran wrap. Flour a surface to work on. Separate dough into 6 equal portions and add your dye by kneading it into a ball of dough. Just keep folding and folding, while adding drops of dye now and then. We used red, orange, yellow, green, blue, and purple. Make sure you make the dough as bright as you can. The color dulls after baking and darkens. Cover the dough you’re not working on with the saran wrap so it doesn’t dry out. 7. Roll out the dough into strips and then roll them together so that each color shows through (we did 3 colors on one side, then 3 on the other, then rolled it out). Once you get it significantly long, start twisting the dough and rip off into sections. Hold the two open ends in your palm, then roll it against a surface to close the bagel. Make these bagels as big or small as you like. Cover your formed bagels. 8. Preheat your oven now to 450°. Then bring a pot of water to boil. Boil the bagels for 30 seconds on each side (they’ll float on the top of the water). After a minute of boiling the bagel, set aside on a rack to let it dry out a bit. Brush on the egg white wash on top of each bagel. 9. Line a pan with baking paper and put your bagels into the oven. Bake for about 15-20 minutes. Check with a toothpick to see if it comes out clean. You can see the colors darken quite a bit, which is why you should’ve dyed it thoroughly beforehand! We ate the bagels fresh from the oven with salmon cream cheese with smoked salmon. It was so amazing. Especially the bagel’s chewy outer shell. I know the Bagel Store uses funfetti, but I really like my savory cream cheese. Let me know if you make these!! Haha yes!! Such a perfect combo!